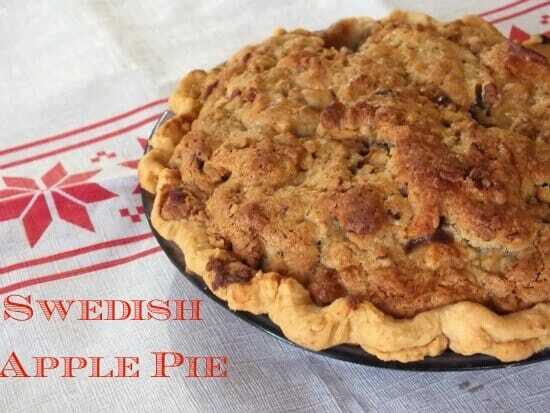 Swedish apple pie – I don’t know if it is Swedish or not, or the recipe just showed up one day in my 1940s cookbook. This is a pie for streusel lovers. Because of the way it is made the streusel about as thick as you handle – more like a crumbly cake… no bread… no cookie… no… well, you’ll just need to try it. The filling bakes up thick and juicy, tangy and full of flavor. The bottom crust is flaky and the topping is nutty and slightly crunchy. The aroma floating out of your oven will have the neighbors at your back door, coffee cups in hand – I don’t care how far away they live. To get the very best flavors out of your apple pies you need to combine several kinds of apples. If you have orchards and heirloom apples available you are in luck. If not try to mix Granny Smith, Honey Crisp, Winesaps, and what you do have available to get a good mix between tangy and sweet. [pullquote]I fear that he who walks over these fields a century hence will not know the pleasure of knocking off wild apples. Ah, poor man, there are many pleasures which he will not know! – Henry D. Thoreau[/pullquote]If not? Just use what you have – it will be delicious. Sadly, when modern man decided to play around with apples in the early 20th century and developed the Red Delicious to the point that it would last for weeks on its way to market he didn’t take into consideration that the flavor and texture would be lost. Apples don’t taste like apples much anymore – and at the rate we are going all food will taste like bland sameness in fifty years. That’s why it’s important to support your local orchards if you have them, maybe plant a couple of your own heirloom trees if you life in an apple friendly climate, or try to buy heirloom organics at the store. Try varieties you haven’t tried before – Cameo, Pink Lady, and such. Mix and match to come up with an apple pie filling that fits your idea of what real apple pie should taste like. When I am slicing apples for pie I like to keep them on the thick side because I think it gives the pie more flavor. Serve this warm with some vanilla ice cream on the side and let the chill winds blow! Tart, tangy, tender apple slices bake in a crispy, crumbly, crust for a unique version of apple streusel pie. Sprinkle the apples with cinnamon, 1 tablespoon sugar, lemon zest, and lemon juice. Fill the crust with sliced apples, mounding in the center. In a medium bowl, mix 1 cup of sugar with the melted butter. Stir in pecans, flour, egg and salt. Spread mixture over the apples. Bake in preheated oven for 60-70 minutes, or until golden brown. Love the recipe! Do you know if it freezes well? It should but I’ve never done it. My husband would LOVE me if I made him this! haha Great recipe Marye! 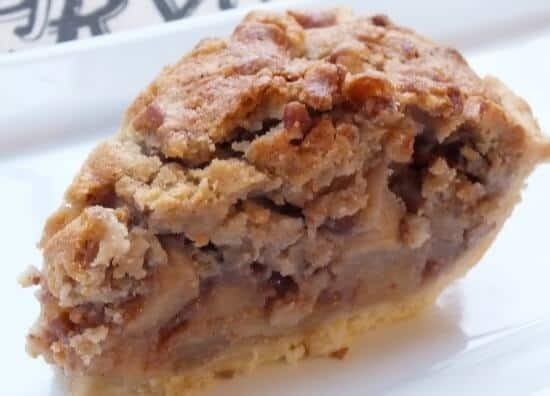 I love love love apple pie and this one looks soooo good! Thanks for sharing! This really does sound delicious! I love going to our local apple orchard to pick my apples. This pie is perfection – especially that topping! And I agree – I like keeping my apples in thick slices for flavor and texture! I am so glad that you liked it. It is definitely unique and one of my favorites! Would you believe that apple pie is one of the very few things I’ve never tried to make? And I don’t know why! This one looks like a fabulous place to start. Apple pie’s on the menu for the weekend.